The possibility of a clash between the two Middle Eastern nations has upset the rather tranquil oil markets. Any conflict could escalate and oil could spike significantly higher. 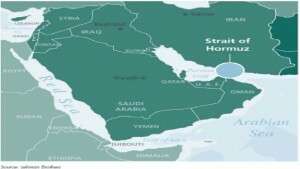 US defense secretary Leon Panetta’s warns that if Iran seeks to block the Strait of Hormuz (17 m barrels a day of oil—a third of the internationally traded seaborne market moves through the Strait), such action would trigger an immediate response by the United States. Daniel 11:40-45 reveals that two forces clash, eventually dragging the world into a devastating world war. We are told that the King of the South (Islamic power) pushes (attacks) the King of the North (European Beast power). This provocation is yet in the future—seeing the spike in oil prices is a reminder that oil is bound to play a major role in end-time events. Oil is the commodity that feeds the world’s economy. Daniel 11:40-45: 40 “At the time of the end, the king of the south shall attack him, but the king of the north shall rush upon him like a whirlwind, with chariots and horsemen, and with many ships. And he shall come into countries and shall overflow and pass through. 41 He shall come into the glorious land. And tens of thousands shall fall, but these shall be delivered out of his hand: Edom and Moab and the main part of the Ammonites. 42 He shall stretch out his hand against the countries, and the land of Egypt shall not escape. 43 He shall become ruler of the treasures of gold and of silver, and all the precious things of Egypt, and the Libyans and the Cushites shall follow in his train. 44 But news from the east and the north shall alarm him, and he shall go out with great fury to destroy and devote many to destruction. 45 And he shall pitch his palatial tents between the sea and the glorious holy mountain. Yet he shall come to his end, with none to help him.